Finding the most effective solution to upgrade a pumping station can be a complex process. Striking the balance between improved performance and minimised costs requires experience and excellent technical abilities. ECS Engineering Services recently delivered a cost effective refurbishment project for the Environment Agency that initially had some very ambitious costs. For the Environment Agency, it is important that all flood defence assets are fit for purpose, so regular performance reviews are used to highlight areas for improvement. In the case of the pumping station at Shardlow in Derbyshire, there was a need to increase the capacity of the four pumps on the site that had reached the end of their service lives. The original pumping station was equipped with four 18.5 kW pumps that transfer surface water from the parish drain into a culvert that runs to the River Trent. During a flood condition, the adjacent canal level also rises and the pumping operation is split between the four pumps; two pumps control the canal level while the remainder continue to manage water levels in the parish drain. 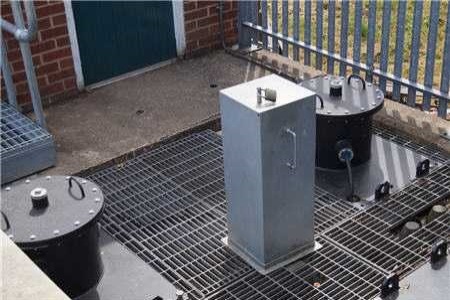 Following extensive flooding in 2007, an initial appraisal of the pumping station had supported a project to upgrade the pumping capacity at Shardlow and this was later reinforced by reports of unreliable pump performance. A number of schemes were proposed, including some that suggested a complete relocation of the pumping station to a new site. The original plans for the pumping station described the pumps as extended spindle pumps, with an original capacity of 200 litres/second. During the discussions surrounding the upgrade project it was suggested that a 10% increase in performance would be desirable to give a greater safety margin during flood events. As framework provider for the Environment Agency, ECS was asked to contribute in these discussions and also appraise potential solutions to meet the objectives of the project. The design engineers looked at potential designs for the new pumps and how they could meet the desired performance levels. Up to this point, the original design specifications had been assumed as correct, but together ECS and the Environment Agency decided to conduct a flow test to confirm the figures. It transpired that the actual flowrate for each existing pump was only 80 litres/second, which immediately transformed the outlook and options for upgrading the pumping station. With this new information, ECS reappraised the options for new pump selection, based on installed costs and performance and made a final suggestion of a canister pump design that provided an increased flowrate with a reduced power requirement of only 16 kW, a significant energy saving over the life of the upgraded pumps. In addition, the noise levels from the pumps was reduced from 90 dB to just 60 dB, providing a welcome improvement for those who moor canal boats nearby. Once the pump designs were agreed, ECS was contracted to deliver the complete project, first producing a detailed 3D model to aid in planning of the works and ensuring a perfect fit for the new equipment, then removing the original pumps, installing the new ones and replacing the grid flooring to ensure a safe environment for operators. The project was completed during the drier summer months with the pumping station remaining operational, with two pumps always available if necessary.